I facilitated a 2-day program “Next Gear: Gearing up forinnovation leadership” on July 5-6 held at Hotel Grand Mercure, Bangalore. Participants came from both for-profit and not-for-profit organizations. The objective of the program was to learn how to lead organization’s innovation initiative effectively. Here are some highlights of the program. 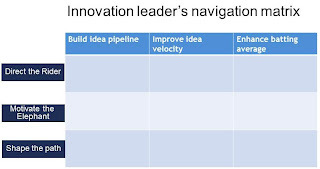 Innovation leader’s navigation matrix: It is not enough to know which medicines to take. It is important to know which one to take when. Every organization’s situation is different. Hence, we parameterized the context using a 3x3 navigation matrix (see below). You need to assess if the problem at hand is primarily that of a dry idea pipeline, low idea velocity or poor batting average. Similarly, we need to assess if the situation is primarily an Elephant problem (lack of motivation) or a Rider problem (lack of direction) or both (e.g. see the Elephant-Rider model). Over the 2-days we filled this matrix with various approaches. How to improve idea velocity? Next we looked at various ways in which we can improve the rate at which ideas can move forward. One of them was: low-cost high-speed experimentation. Among the many real life examples we looked at, one was the pea-plant experiment performed by the father of Indian cinema, Dadasaheb Phalke a hundred years ago (in 1912). The experiment got him funding for his first film, Raja Harischandra. Design Thinking vs TRIZ: We ended day-1 with a panel discussion on two creative problem solving methodologies: TRIZ and Design Thinking. Dr. Bala Ramadurai a TRIZ expert and Lakshman Pachineela a Design Thinking expert shared their views on how these two approaches work. Managing big bets: During this session we looked at various approaches of managing big bets e.g. innovation sandbox. At the end, we had a panel discussion where Dr. Ashwin Naik, CEO of Vaatsalya, Dr. Ishwar Parulkar, CTO, Cisco and JayeshBadani, CEO, Ideaken shared their experiences in managing big bets. 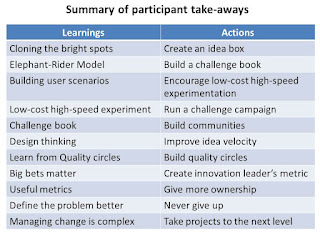 Enabling a culture change: Most innovation initiatives need to enable a culture change as well. How do you do it? Raja Chidambaram a change facilitation consultant and V R Prasanna, CEO of Sikshana Foundation shared their perspectives on the topic. Participant presentations: Participants presented the two actions they plan to take away from the workshop. Within two months several participants had implemented at least one of their actions such as executing a challenge campaign. 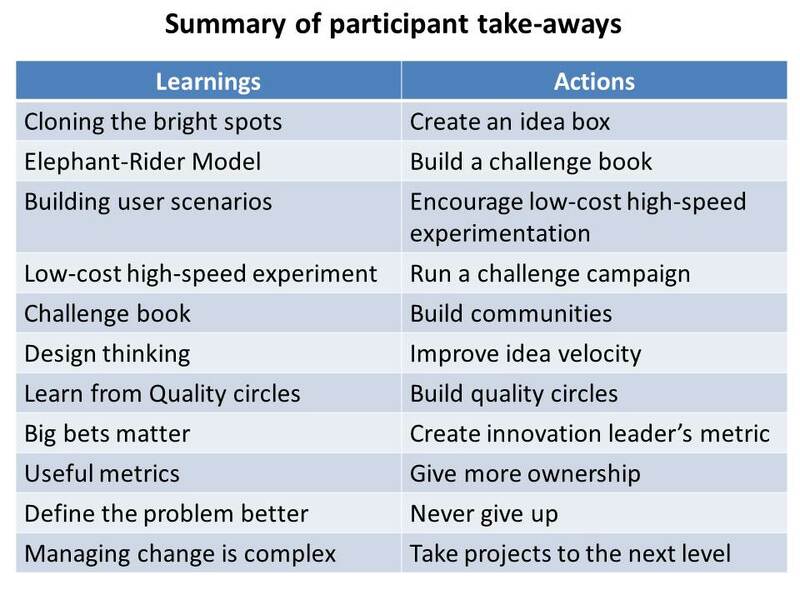 Here is a summary of participant take-aways. Source: Phalke’s photo is from the film Harischandrachi Factory. Grab your jackstands, and raise them so the top notch is even with the center of the wheel. I use the notch as a string guide. Thanks Vinay for the update.